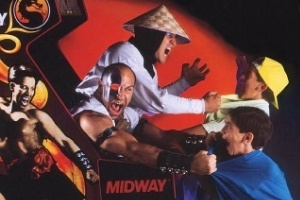 Analysts suggest that if Midway are forced to sell off the Mortal Kombat franchise, Activision might just take it off their hands. Speaking to GameDaily, analysts Michael Pachter (I told you he was everywhere!) and Mike Hickey agreed that Activison seemed a very likely buyer for the IP. Hickey summed it up by saying "Activision currently lacks a distinctive fighting game in their IP portfolio and has been open about using their strong cash position for IP acquisition." "That said, we expect the Activision team to remain a disciplined bidder, despite a ballooning cash position," he added. Pachter largely agreed with Hickey's assessment of the situation, and added, "I don't think [Activision] would buy Mortal Kombat unless they got the developers, too. That franchise is really a product of the creative [team], not just the IP, and I don't know if the developers have any interest in working for [Activision]." Despite what Pachter says however, Activision's eye will be firmly on the bottom line, and given the sorry state of many of the recent Mortal Kombat games, losing the developers might not be such a bad idea. Even the most recent title, Mortal Kombat vs DC Universe, an attempt to reboot the series after nearly a decade of hit and miss releases, received lacklustre reviews when it was released last year. Selling off their most high profile IP might just be the thing that saves Midway from closure, but if they do, can they survive without it? So... 8 squeals in one year, it's going to be GH all over again. No.. Please.. NO! This just cannot happen! Mortal Kombat died a horrible death a long time ago anyway. It lost it's way with ... A PG-13 GAME LOLWHUT? Mortal Kombat is and always has been about over the top action and bloody, violent death. It's the "Gears of War" of fighting games. Of course knowing activision they'll just give us a SF4 clone with Scorpion ._. did not die from in a glorious haduken accident like we had all expected. Who cares, I said it way back then and I still say it now STREET FIGHTER OWNS MORTAL KOMBAT! No, no series deserves that. Has there even been a decent Mortal Kombat since MK: Trilogy or Ultimate Mortal Kombat? Seems like as soon as it moved to 3D it lost any fun it used to have. Speaking as a fan of MK 1, 2, 3, Ultimate Mortal Kombat, and Mortal Kombat Trilogy, I can say the series needs to die off. Nothing can revive it now, it's a lackluster fighting game, and the violence isn't enough to carry it anymore. We all know what Activision does to series don't we. Fantastic... I can see it now. Those are just a few, and if we see one of those in the upcoming year. I'm going to kill somebody at Activision. because one button mash fest can really own another. Does anyone else really, really feel that the fighting games series are overmilked? It's like they're beating a dead horse, but it still gives results. Well, I guess this just isn't my cup of tea. True, a fighting series becomes just like Madden or MBL games. The same people every year, but hey, their stats are different, or they might have a new play or a new combo. If you stop buying bad games, people will stop making them. I think fighting games are a genre that would benefit from DLC more than most other genres. Add some characters, release patches to fix balancing issues, new stages if it's the kind of game (like Smash Bros) where the stage affects more than the background music and ease of ring-outs, things like that. If all they do is update graphics and (sometimes) mechanics and add new characters without making many (if any) changes to the others... well, I don't see how that merits a full game. But I don't think anything like that'll happen thanks to good 'ole capitalism.